The Ford Mondeo Hybrid is the firm’s first hybrid electric car that’s been built by the carmaker in Europe and the first ones have begun rolling off the production line. Using a specially developed 2.0 litre petrol engine, the Ford Mondeo Hybrid also uses an electric motor to achieve 67mpg. However, with its 1.4 kWh lithium-ion battery, the hybrid will help owners enjoy fuel economy of 101mpg for urban driving. To help underline its low running costs, the Ford Mondeo Hybrid also has CO2 emissions of 99g/km which means it is (currently) free from road tax. The firm says its new hybrid offers buyers the best of both worlds in that the car has better efficiency and lower emissions that come with electric power while having the performance and range of a traditional petrol engine. Indeed, Ford is now gearing up to be a major player in the hybrid market and the new Mondeo will sit alongside the firm’s Focus Electric as well as its impressive EcoBoost models and its ECOnetic diesel units. The new model is being made at the carmaker’s planned in Valencia, Spain, and it will join the widest ever range of engines available for the Mondeo. Buyers can also choose from Ford’s new 1.5 litre eco-boost petrol unit or the enhanced 2.0 litre TDCi diesel unit. 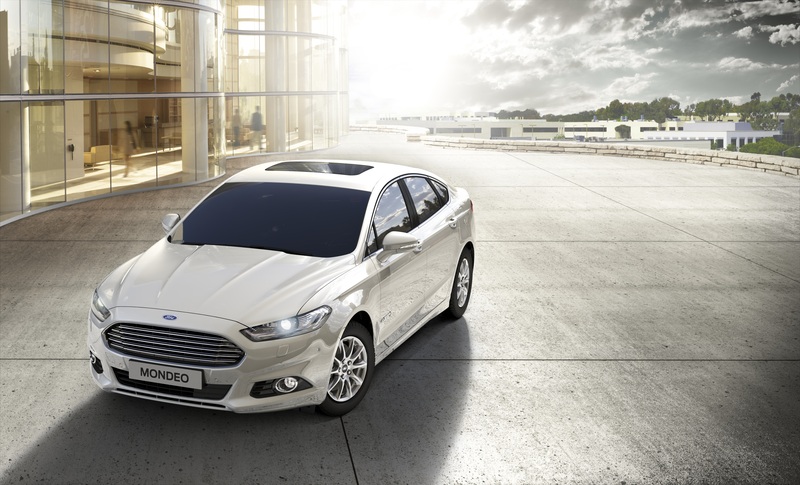 Ford says that its new Mondeo hybrid will not carry a premium and it will be priced to be competitive with the firm’s diesel powered Mondeo’s. Ford says this underlines its promise to give customers who have fuel efficiency at the top of their list, the choice they are increasingly demanding. The Ford Mondeo Hybrid is available from this month from around £25,000 in the four-door saloon version which is the same price as the 2.0 litre diesel Titanium Powershift model. This entry was posted in Car Leasing, Cars, Executive Cars, Low Emissions Cars and tagged Ford Hybrid, ford mondeo, Ford Mondeo Hybrid by Steve Lumley. Bookmark the permalink.